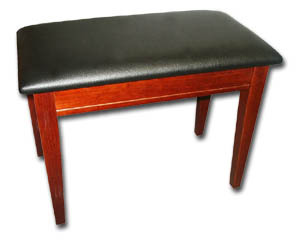 A high quality digital piano bench, this piano bench is ideal for keyboards or digital pianos. Constructed of solid hardwood with a black padded vinyl seat and music storage compartment, the digital piano bench measures 13" (W) x 25" (L), and is 18.5" high. . This keyboard bench is one of the nicer benches you'll find for your digital piano. 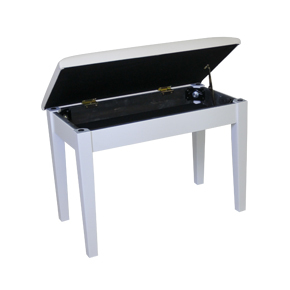 Typically, digital piano benches have metal legs and are put together rather cheaply. This on the other hand is manufactured like an upright piano bench, focusing on quality. It uses hardwood legs, and heavy duty brass hardware. As well, it has caps on the end of the legs to protect your floor from scratches. Finally, and perhaps most surprising for a digital piano bench, the music compartment is routed in, which provides additional strength and stability. Cheap keyboard benches simply staple the bottom panel in. In our opinion, it is definitely worth spending a few extra dollars to get a quality piece of furniture for your keyboard/digital piano. It will both look much better, and last longer.